v2smart has no other items for sale. There are 680 items available. Please enter a number less than or equal to 680. Item exactly as described and shipped very quickly. Very fast shipping. Works great too. A+++ Lightning Quick Shipping! Great Product! Highly Recommended! I purchased this item to install into an older ASUS P5Q-EM DO motherboard that I found laying around the garage. The item was packaged well and it worked as expected. The fan came with heat synch adhesive per-installed but luckily the Dual Core processor that I purchased also come with some because initially when I installed the fan the computer reported overheating problem. But after I installed the extra adhesive, everything worked fine. I would definitely recommend this item and the seller. Don't buy it. Way too LOUD! Get the real Intel version instead. Don't waste you money on this one by Foxconn even though this has the Intel label on the fan. Get the Genuine Intel one instead. This fan and heatsink by Foxconn screams! It is horribly loud and only gets worse under a load. Very disappointed. The mere fact that its low cost doesn't mean it is a bargain. It's just LOUD. Way too LOUD. As far as cooling goes, the processor didn't burn up so I guess it cools as a heatsink should. The stock CPU cooler is great for Pentiums and i3 CPUs. However if you intend to get an i5 or higher, I would invest in a high quality after market CPU cooler, or a water cooler. This is due to the fact those tend to get more hot. 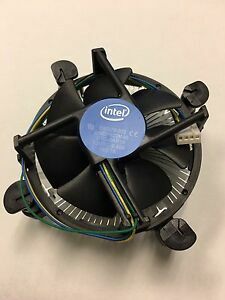 Great cheap original Intel cooler. It works great, doing what it should do. However, it is a little loud and if you want something less noisy, get a cooler master. Final thought, for the price, you can't go wrong.